Annan Athletic followed up their promising start to the season with an opening Ladbrokes League 2 victory over Queens Park at the National Stadium. The Annan team showed a couple of changes from the team which did well against Queen of the South the previous week, Steven Sloan pulled up in the warm up and was replaced by Ryan McStay and with Rabine Omar suspended following his sending off his place was taken by Josh Todd. Queens Park were forced to make changes defensively by injuries to Gavin Mitchell, Tony Quinn and Sean Burns. James Baty and Scott Gibson replaced Quinn and Burns and up front Jamie McKernon and Billy Mortimer started in place of John Carter and David Galt. The opening quarter were fairly uneventful with neither team testing their respective keepers. The first serious shot of the game came in 18 minutes. Woods’ won a free kick 20 yards out but his free kick was confidently saved by Hart. Annan’s first real attempt on goal arrived on the half hour mark when McColm got his head to a cross and Jamie McKernon did well to block Osadolor’s resulting shot with Muir taking it comfortably. 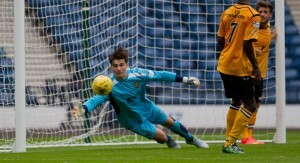 The Spiders started the second half promisingly with Hart pulling off an important save to deny Mortimer and minutes later the Annan keeper came to his teams rescue once again when he turned McKernon’s effort round the post for a corner and from the resulting corner Woods blasted over the bar. The momentum of the game changed after Annan brought on Scott Norman for Ryan McStay and the team was re-arranged with Osadolor and McColm pushed up front and within minutes Annan went ahead with a goal which cut open the Queen’s Park defence. Weatherson prodded the ball out to the right and Osadolor skipped past the challenge of Wharton along the byline ending with a cut back to Matty Flynn who side footed the ball into the net from 12 yards. Queen’s were presented with a chance when Peter Watson’s 72nd minute short pass back was intercepted by Mortimer and once again Hart rescued the situation with a confident save to deny Mortimer and maintain Annan’s slender goal lead on the game. Wharton was lucky to receive only a booking for denying Osadolor 25 yards out after the Annan front man appeared to skip past the defender before being fouled. Queens Park then sent on Marlow and Carter for McLeish and McVey and Annan sent on their second Trialist for McColm. The final minutes of the match were predominantly dominated by the home team taking the game to Annan seeking the all important eqauliser. Annan defended David Galt’s effort blocking the shot and in the final minute Woods came close with a shot that was deflected for a corner and from the resulting corner Hart saved the initial attempt and the Annan defence cleared the danger to secure an opening league fixture which has not been achieved since they defeated Cowdenbeath in their opening SFL fixture. This was a match Annan will look back on as a game where they ground out a result without displaying the flare which has been evident in their previous matches, defensively Annan played very well and they adequately coped with any threat that Queens Park mustered up front and that was possibly the major concern to Queens manager Gus Macpherson’s injury hit team. QUEENS PARK :William Muir, Connor McVey (John Carter 79 min), Scott Gibson, Bryan Wharton, James Batey, Craig MclEISH (Cammy Marlow 76 min), Paul Woods, Jamie McKernon (David Galt 68 min), Billy Mortimer, Vincent Berry, Joe Bradley. SUBS NOT USED: Connor O’Boyle, Ryan McGeever, Jamie Gallagher, Ryan Hynes. ANNAN ATHLETIC: Jordan Hart, Steven Black,Steven Swinglehurst, Martin McNiff, Peter Watson,Ryan McStay ( Scott Norman 60 min ), Smart Osadolor, Mathew Flynn , Peter Weatherson, Josh Todd ,Stuart McColm ( Trialist 78 min). SUBS NOT USED: Blair Currie, Jamie Watson, Connor Liddell, Trialist, .